The troubles in Egypt continue to dominate the headlines, without a clear path forward at the moment. Given the threats that this may pose to other regimes in the region, I thought that this might be an appropriate moment to start providing an updated list of the current largest producers of crude oil and natural gas, and to use this set of information in later posts to discuss such things as potential future export levels. I used to do this in a post that I called “Updating my Lecture Slides”, since this was one of the opening topics when I still taught classes, and the numbers changed in an interesting way from year to year. (And as an aside it is interesting to go back 3 years and see what was then important, and also what has not.) As a point of reference, at the beginning, I am going to put up the table of leaders in oil production in 2008, from the EIA. Of these I am going to discuss the top half-dozen in this post, and then carry the discussion on to lower players on the list in future Sunday posts for a short while. 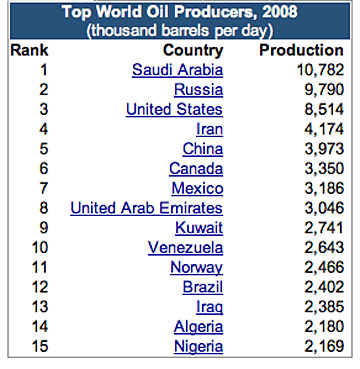 At the moment Russia is leading the field in crude oil production, with a reported 10.21 mbd in January 2011. This is still an increasing quantity, being up 1.6% y-o-y and President Putin has claimed that Russia has sufficient reserves that it can sustain prediction at 10 mbd for over a decade. (Note that Russia includes condensate in their total). Of the Russian total, it is reported that some 5.5 mbd was exported, which is a 2.4% decline y-o-y. And natural gas production in Russia is running at around 72.4 bcf/day, which is down 0.3% y-o-y. (There is an interesting book “Non-Gazprom Gas Producers in Russia” by James Henderson that just came out on the internal politics of Gas production in Russia that is well worth a read, and which I hope to review soon). OPEC, on the other hand see Russian exports in November 2010 running at some 6.557 mbd. Onto this it adds 2.557 mbd of refined product. Obviously I need to start getting into these numbers in more detail, to find where the real story is. The Kingdom of Saudi Arabia (KSA) is now running relatively neck-and-neck with Russia, when one includes condensate and other NGL. The EIA estimate that in 2010 the country averaged 8.4 mbd of crude oil production and 1.8 mbd of other hydrocarbon liquids. The EIA further estimates that 5 mbd of this still comes from the Ghawar oilfield, which it notes puts that field ahead of production by every other country but Russia and the United States. Other field production is given as Safaniya at 1.5 mbd; Khurais at 1.2 mbd; Qatif at 0.5 mbd; Shaybah at 0.5 mbd; Zuluf at 0.45 mbd; and Abqaiq at 0.4 mbd. In December 2010 OPEC reported that KSA produced 8.3 mbd of crude. (The report does not break out NGL statistics within OPEC but totals the volume at 4.79 mbd in 2010). Saudi Arabia produces (and uses) around 3.2 bcf of natural gas. Running third in the production stakes lies the United States. The latest TWIP shows a production of 5.568 mbd in the last week of January. This is an increase of 3% y-o-y, though production may have peaked in October. NGL production is now running at around 2 mbd. If one adds these together then the total for petroleum products becomes 7.27 mbd. The cold weather has had an impact on production, with Natural gas production running at around 62 Bcf , which is about 5.7% higher y-o-y. One of the questions that might need to be asked this year relates to the longer term life of the deeper wells in the Gulf, given the declining production from Thunder Horse, as well as the increasing water cut. Darwinian has noted that production was down to 0.146 mbd in November at 50% water cut . China has overtaken Iran to become the fourth largest producer of crude. It is also becoming an increasingly greater importer of oil, and thus interest is not only in what it is producing, but the more than 50% of its need that it is now drawing from the international market. The EIA estimate that crude oil amounts to about 96% of liquid production. Pipelines from Eastern Siberia and Turkmenistan into China are drawing resources at an increasing rate and in this last year imports covered just over half of China’s oil consumption. Projections of a drop in demand or at least in the rate of growth in that demand, may be no more than wishful thinking. It appears that Chinese production reached 4 mbd of crude oil domestically, though its foreign investments yielded an additional 1.47 mbd. Over and above that were the purchases that it made. Natural gas production reached 8 bcf/day in 2009, but Chinese figures for 2010 may have fallen below this level, with the difference being made up though an increase in LNG imports. (If the amount imported from Chinese owned entities abroad are added then this equals the EIA 8 bcf/day number). Iran is now running fifth in production, and according to OPEC it is now producing 3.681 mbd and has sensibly been able to hold average production at the same level as in 2009. (At 3.7 mbd) but even such oil optimists as Michael Lynch have doubts that it can sustain this level of production much longer. Stuart Stanniford has just had a look but saw nothing to indicate that the country isn’t producing flat out at this level. China continues to buy 0.46 mbd from Iran. India was importing about the same quantity (12% of its needs) from Iran, but has become enmeshed in a dispute that has only just been settled. The EIA are hoping that there will be a large increase in natural gas production from both Iran and Qatar in future years, largely from the South Pars field in the latter case. Current plans are for production to increase to 31 bcf/day over the next five years. Iran, because of geography, imports some natural gas from Turkmenistan, and intends the bulk of its exports to be to Europe via Turkey. 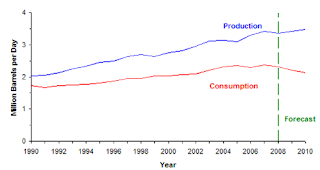 When writing these statistics, and considering future levels of production and exports, I am very conscious of the likelihood of the Export Land Model being applicable to almost all producers. However Canada the last of this top group, in the eyes of the EIA is likely to go against that trend. 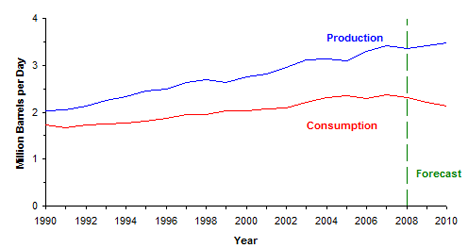 EIA projection of production from Canada, in 2009. 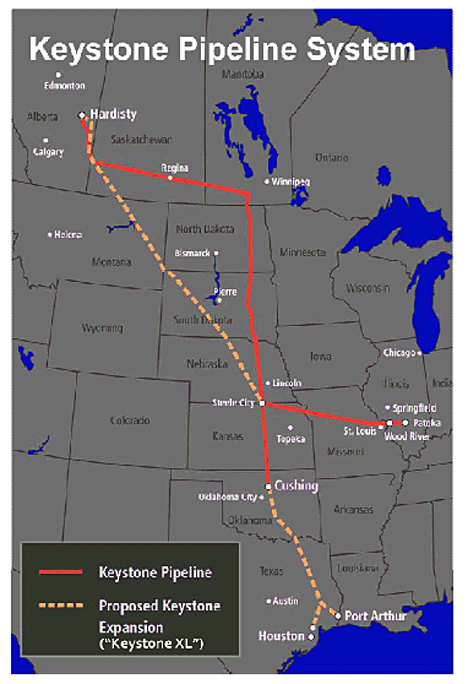 One of the questions as to how much Canada will continue to export to the United States comes with the creation of a proposed oil pipeline from the oil sands of Athabasca down from Alberta to Texas. It is called the Keystone XL project and was a subject of discussion when President Obama met with the Canadian Prime Minister last Friday. It even finds favor with the Washington Post. It should be able to provide a flow of up to 1 mbd. In December 2010 Canada produced some 3.1 mbd of crude, which divides into 805 kbd of conventional light crude, 955 kbd of upgraded syncrude, 140 kbd of NGLs and condensate, and 1.2 mbd of heavy crude. The December figure for natural gas was 13.3 bcd/day. 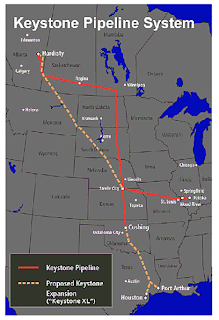 I will close with a map showing the projected path of the new pipeline, and take this up again next week. There is, however, one final piece of addition that one can make. If we add the volumes from the 6 top producers in 2008, then their total production was 40.583 mbd. The total for the current six top producers is 38.461 mbd. Given that some of the cuts in the KSA may have been voluntary, I believe, at this stage, that there are no great conclusions, in the short term, that we can draw from the difference. However, as I start to go through the countries and fields in more detail, that thought will be revisited. Bittooth is an excellent and informative website. Thank you for sharing your pretty nice post about health. Julie Auto Fashion Blog really appreciate your efforts and will be waiting for your next writing. I appreciate that you produced this wonderful article to help us get more knowledge about this topic. I know, it is not an easy task to write such a big article in one day, I've tried that and I've failed. But, here you are, trying the big task and finishing it off and getting good comments and ratings. That is one hell of a job done!Litchfield county airport car service. This is an excellent and informative website. Thanks for sharing your pretty nice post. Rmglife Info, rmgcosting , Autogarments , LectraWilcom , SaifSafe really appreciate your efforts and will be waiting for your next writing. Norton.com/setup: Norton is a computer security solution company which deals in products like Database Security, Data Protection, Endpoint Protection, Security Management, Network Security and Compliance, Security Information and Event Management, Email and Web security risk, and Security as a service. Even though Norton is engaged in various fields, it is extremely popular amongst the people who have personal computers at homes, school, and work. Are you looking steps for uninstall Webroot Antivirus go to following links. How to uninstall Webroot security? Are you looking for uninstall Norton, How to uninstall Norton? and Norton uninstall you can learn in this post all related to Norton security product available 24*7! Norton uninstall | uninstall Norton | How do I uninstall Norton security product? Norton.com/setup makes it simple to understand its uses by giving a user-friendly interface. The antivirus software delivers services like protection, analysis of your security status and prolongs Norton.com/setup the layer of shields to protect other PCs, Macs, Smartphone, and tablets. McAfee Antivirus is basic security programming which holds the client's gadget far from a few influencing infections, malware, spyware, Rootkit, Trojans, adware and different noxious digital dangers visit www.mcafee/activate. Nice Post. But if you want to any kind of help related to microsoft windows 7 | support windows 10 | HP Laptop Support Number|then contactforgeeks.com is there to provide you instant service. The unique 25 digit code for McAfee security enter this code and activate your McAfee security product on Windows, Mac and Android devices. and the Best Part is Your Perfect Content Quality and Quantity and Perfect Writing Skills.avg.com/retail -Avg retail card Antivirus, international security software has been providing protection against malware, virus, and cyber risks etc. to multiple devices like computer, android and iOS with its numerous security features ever since it was developed. To get detail about avg visit www.avg.com/retail. McAfee.com/Activate - Activate your McAfee Security Product. Instant Online McAfee Activate, Download & Installation via mcafee acivate 25 digit code is just a phone call away or you can visit www.mcafee.com/activate. You can seek in all respects rapidly as per the particular issue and discover the arrangement dependent on your printer show. Here are some common problems you can face with your HP printer Support.